I haven't done a Challenge Roundup in ages. Mostly because I haven't read any challenge books in all that time. This month I finally did. Carl's Challenge is going well. I've read 4 books so far and several short stories. I plan on watching The Uninvited this month sometime. Right now I'm in the middle of Miss Peregrine's Home for Peculiar Children. I fell way behind on this one. It started in July and I only read my first book the end of September. That's it for reading challenges this month. Jenn started Murder, Monsters and Mayhem month over at Jenn's Bookshelves. I have a contribution coming up myself. A little Lovecraft. 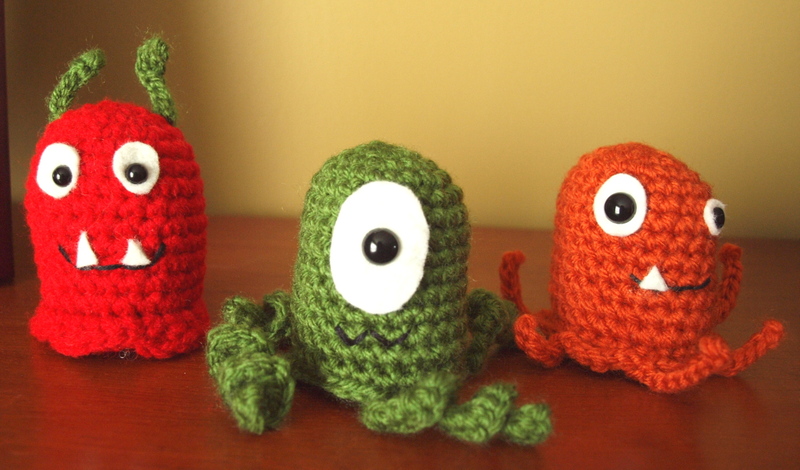 And since Lovecraft loved his monsters, I crocheted a couple for Halloween. The instructions to make your own little monsters can be found at Craft blog. Just finished Miss Peregrine's Home for Peculiar Children on Friday. LOVED it! Such a perfect pick for R.I.P.! Your little monsters are adorable! I am enjoying the RIP challenge so far. I have no idea how much I have read. Getting organized is on my to-do list. Aww, I love those little monsters! Too bad I don't crochet. I'll have to see if there are patterns out there for knitted ones. The little monsters are too adorable! OMG...the crocheted Cthulhu is awesome! I've always wanted to learn to crochet, I bought books and everything, I could get the hang of it. I want to read MPHPC, I was hoping to win it during the Read Banned Books giveaway but didn't. So now I will have to get it myself, which is okay too. I heard it's spectacular.